Pythagoras was born around 580 B.C.E. on the Greek island of Samos. (There are no reliable contemporary records of his life, so dates cited are approximate.) He was probably a student of Thales (c. 640­546 B.C.E. ), a merchant­ philosopher who predicted the solar eclipse of 585 B.C.E. and who first recognized some mathematical patterns in the physical world. For example, Thales is credited with the proposals that any diameter bisects a circle and that angles of base/sides of an isosceles triangle are identical. Those generalizations were groundbreaking, going beyond mere measurement, which was the only way numbers were used before Thales. Around 530 B.C.E. 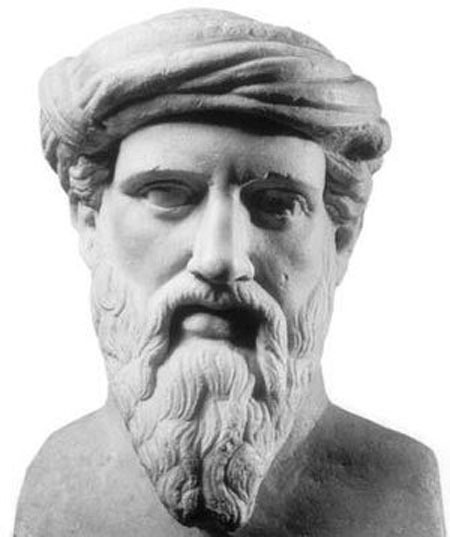 Pythagoras fled Samos, which was controlled by despotic rulers, and moved to Crotona, a Greek colony in southern Italy, where he began to teach mathematics and philosophy. He was a popular lecturer and his audiences included the upper class and, notably, women. His most loyal followers organized the secret Order of Pythagoras, symbolized by a five­ pointed star. Because none of Pythagoras’ original writings have survived, it is difficult to know which works were his and which were developed by his followers. It is certain that his influence on his students was profound, both in practice of mathematics and in attribution of mystical significance to numbers. The Pythagoreans would represent numbers as dots in a symmetrical grid. Those that could be arranged as two rows of two dots, three rows of three dots, etc., were called square numbers because their visual representation was a square array and each could be calculated from its predecessor by adding an L­shaped border like a carpenter’s square. They could see relationships in large arrays, such as the fact that to build onto a square with n2 points, 2n+1 points must be added to complete another square, and that there is always an odd number difference (5, 7, 9, 11 . . .) between successive squares (4, 9, 16, 25, 36 . . .). The Pythagorean Theorem is probably older than Pythagoras but he and his followers are credited with its proof. The theorem states that the diagonal c of a rectangle with sides of lengths a and b is the square root of the sum of the squares of its sides: c2 = a2 + b2. Applied to a square with side length of 1, the diagonal is the square root of 2, which is not a rational number (that is, it is not a ratio of two whole numbers). This insight challenged the Pythagorean assumption that all mathematical relationships would be whole numbers. Hippasus, one of the Pythagoreans, reputedly was thrown overboard while on a sea voyage as punishment for this discovery. Pythagoras died around 500 B.C.E. The Pythagorean brotherhood continued to work for at least 50 years afterward. Pythagoras and his followers established the basis for much of the mathematics, particularly in number theory and geometry, used today. Pythagoras and his followers developed mathematics in two ways. They made functional generalizations about whole numbers that we call laws and theorems today, and they developed them by seeking logical proofs. This marriage of mathematics and reason was a new way to find truth, one that contributed immeasurably to science and to civilization in general. The Pythagorean assumption that each number has its own inner meaning and secret vibrations that are the secret to all knowledge, however, has led to some practices, based on superstition rather than science, that continue to the present day. Numerology, gematria (converting letters and words into numbers), the Elliot Wave Theory of stock market prediction, fear of the numbers 13 and 666, and Bible­numerists can trace their heritage to Pythagoras. Not all of the ancient intuitions were superstition, however. Pythagoreans were among the first to assume that Earth itself moves around a central fire, a concept that NICOLAUS COPERNICUS acknowledged was helpful to him in formulating his Sun­centered model of the local planetary system. DMITRY MENDELEYEV assumed whole number atomic weights in assembling his successful periodic table in the nineteenth century, attributing fractional results to weighing errors when isotopes were unknown. Modern atomic numbers, products of twentieth­century science, do support Pythagoras’ hunch that all matter can be described with whole numbers. Pythagoras – c. 580­c. 500 B.C.E.